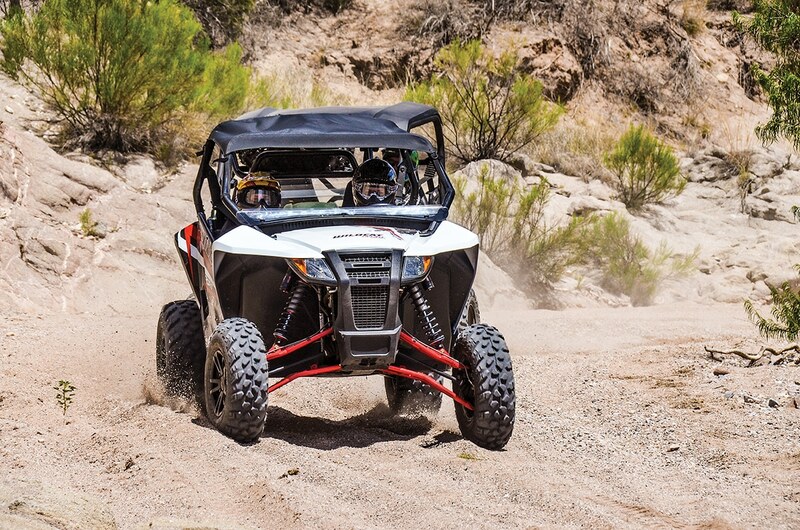 As much fun as our UTVs are, they’re large vehicles, and most require trailering to the trailhead or riding area. Over the years we’ve learned a few trailering tricks, such as how to hook up by yourself without a back-up camera on the tow vehicle. Some things we’ve learned the hard way, like how long a trailer tire lasts before it fails and takes out a fender—or worse. 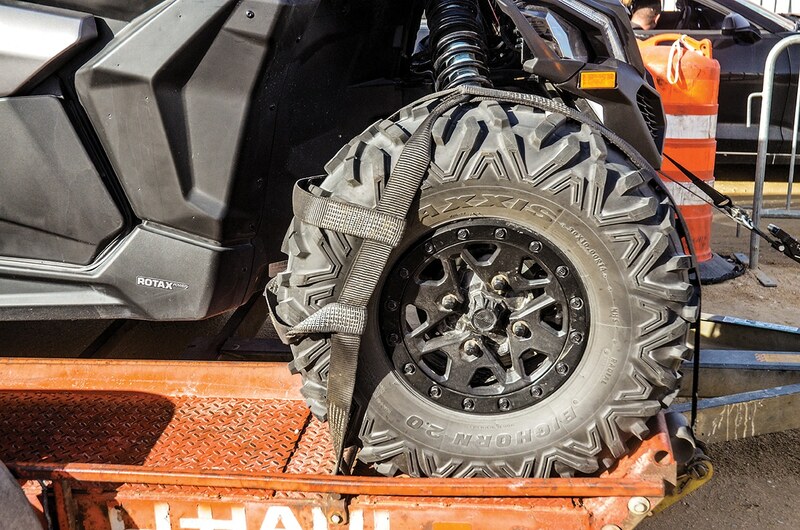 Here are UTV Action’s “Top 24 Trailering Tips” for getting your UTV to the ride spot and back. After wheel straps, the next best tie-down is one with soft straps and carabiners. 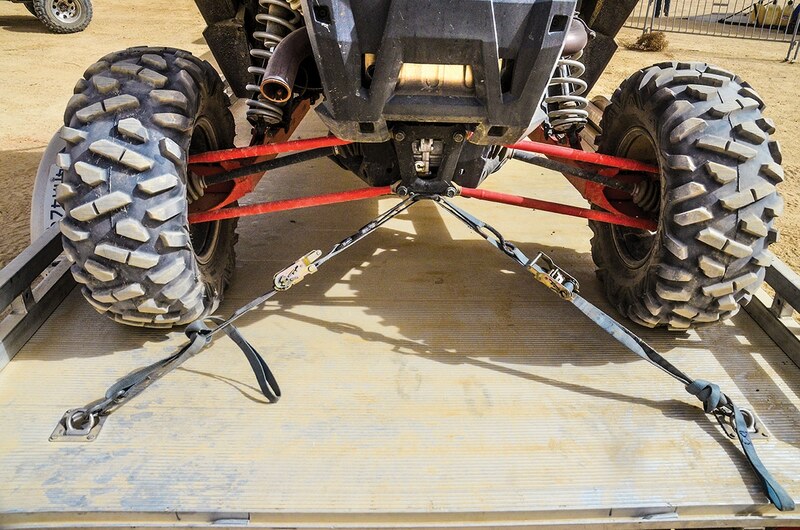 Today’s UTVs have so much travel that a big bump will unhook tie-downs without closed ends. 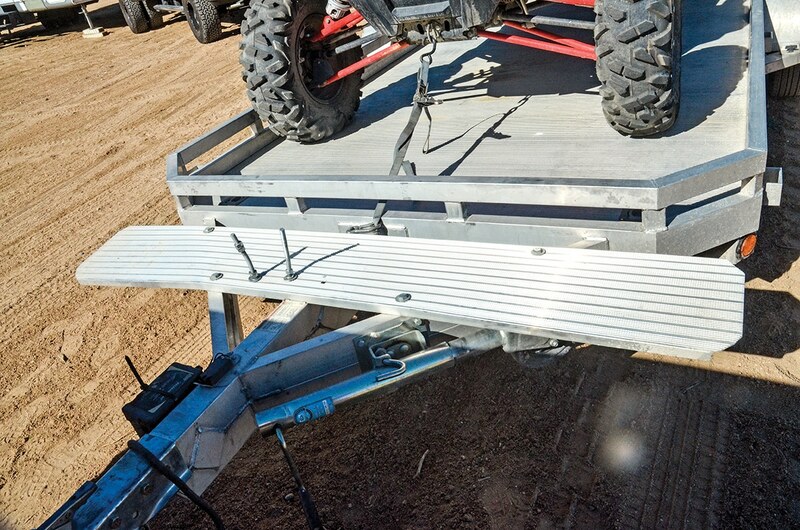 Our Aluma 7816 trailer has aluminum ramps held in place by aluminum L-pins. On dirt roads the ramps rattle and rub against the pins, eventually rubbing all the way through. Placing PVC plumbing pipe over the L-pins is a cheap, easily replaceable fix. 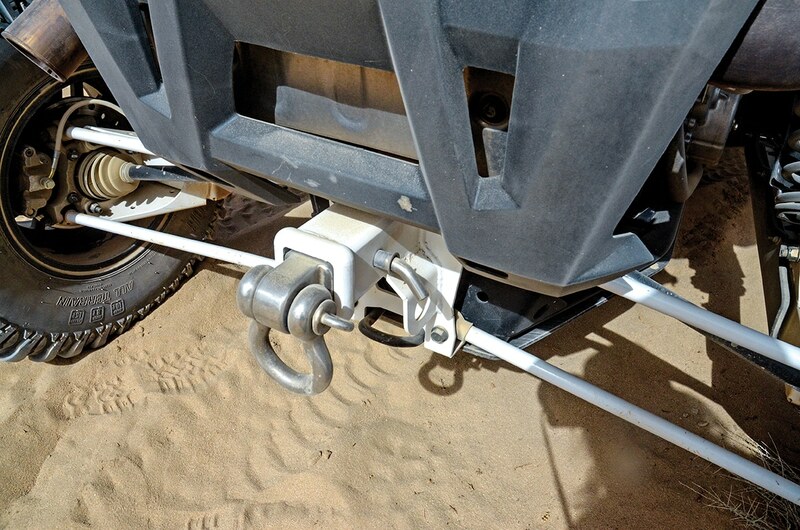 Carry extra hitch pins in case one breaks or otherwise gets lost. We lost one the same day this photo was taken. 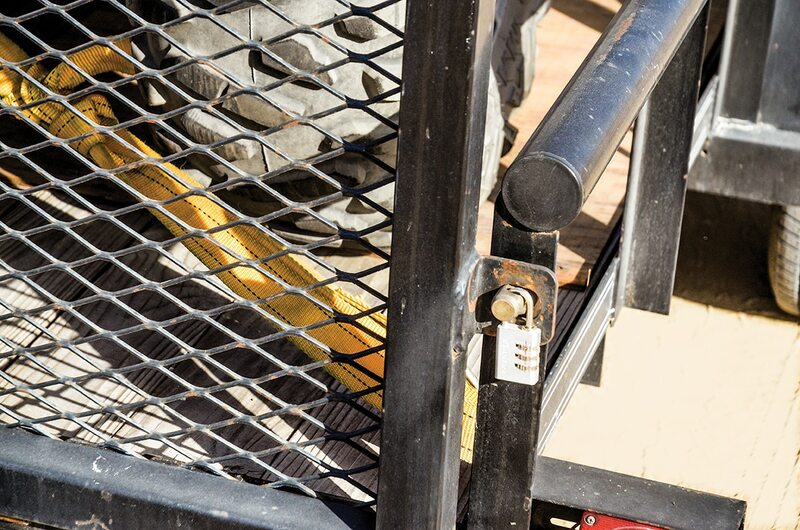 Straps that capture the UTV’s tires are the most secure way to tie to a trailer, and they have the added benefit of letting the UTV’s suspension work while towing. 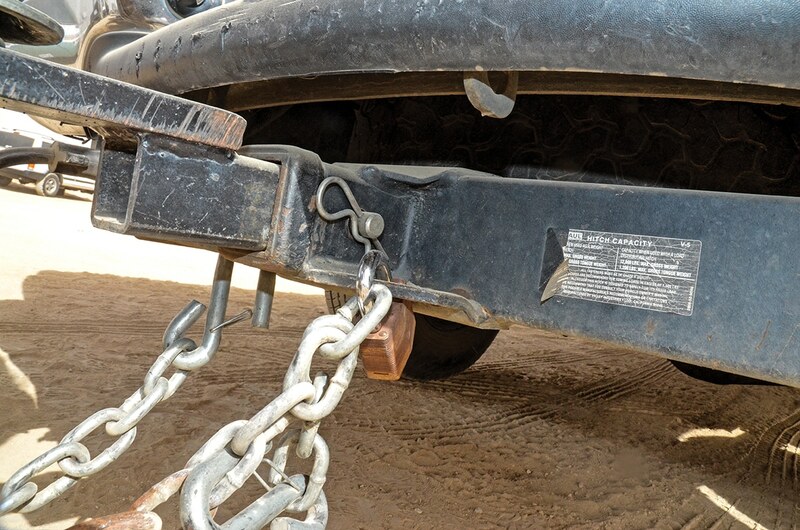 This owner has a cool way of keeping the ratchet from scratching the trailer or UTV—a section of PVC tubing acts as a spacer that is held in place by the strap. Another tip: if you only trailer once or twice a year, why not rent? If your UTV doesn’t have a winch and you break a CVT belt on the trail, how do you get it back on the trailer? 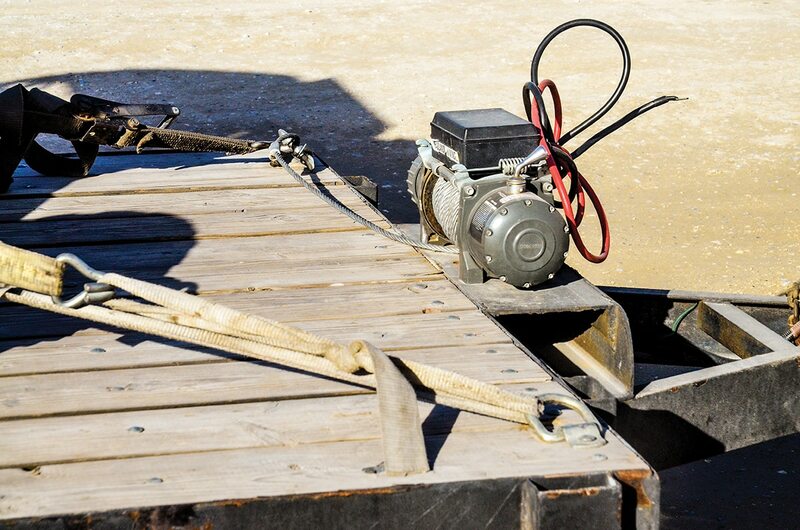 A winch of sufficient power to pull your UTV onto the trailer will solve that dilemma, while a cover for the winch will make sure it’s in working order if and when you need it. A lock is more secure than a tailgate or hitch pin, and a combination lock never needs a key that could be lost or misplaced. 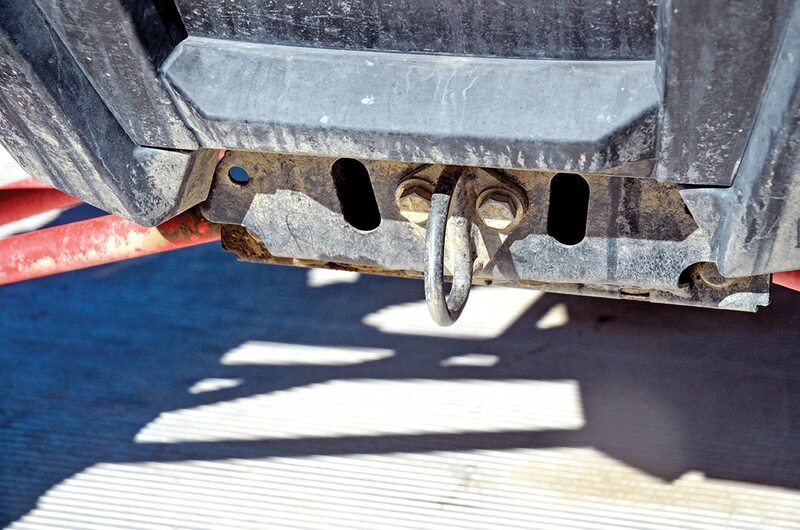 Wrapping a towel around a tie-down will keep it from rubbing against your UTV’s powdercoating and/or bodywork. 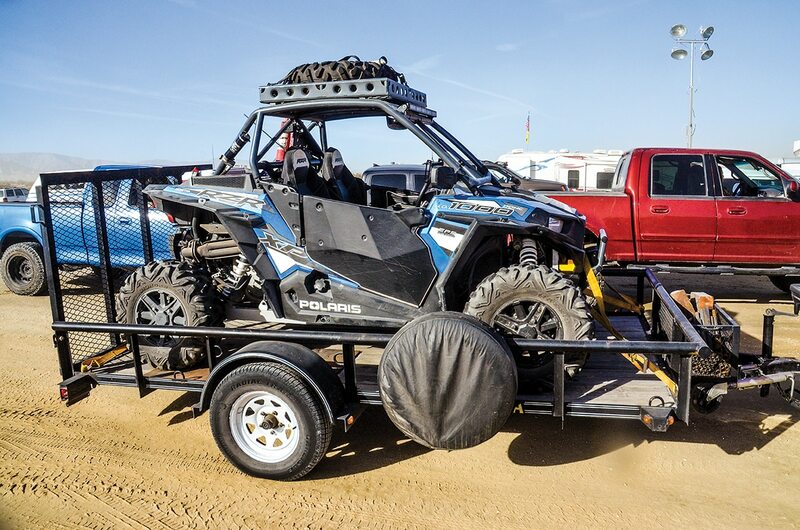 If you have a soft roof on your UTV and don’t have an enclosed trailer, remove the top before trailering. 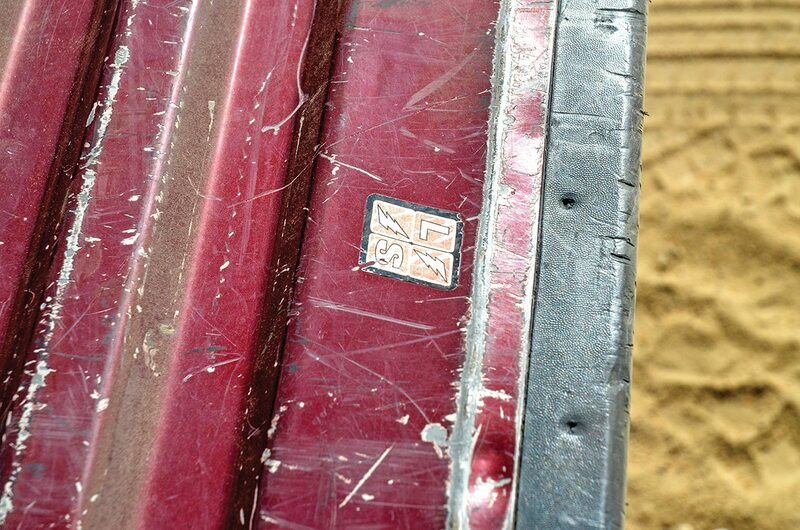 We destroyed a Pioneer 500 soft top driving across Arizona at 75–80 mph. 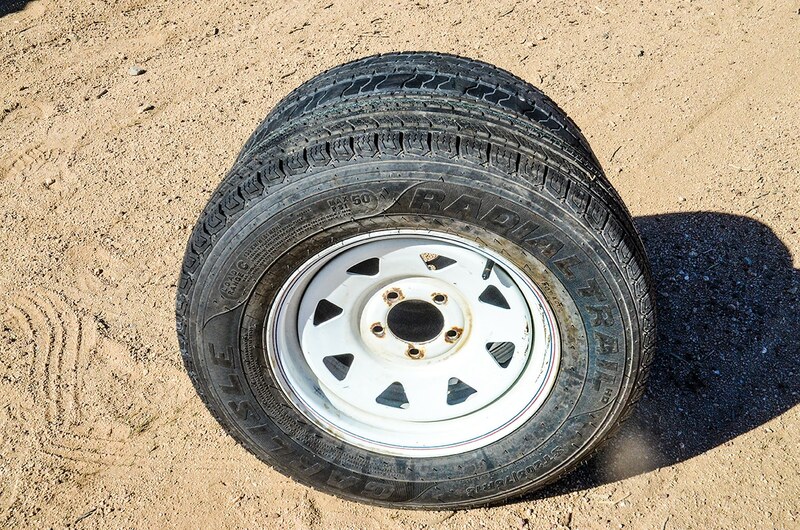 Trailer tires have a shelf life, as sun and weather can dry them out or cause cracking. Our Aluma’s tires lasted eight years and then two failed. Replace them every seven to eight years, like a mattress. 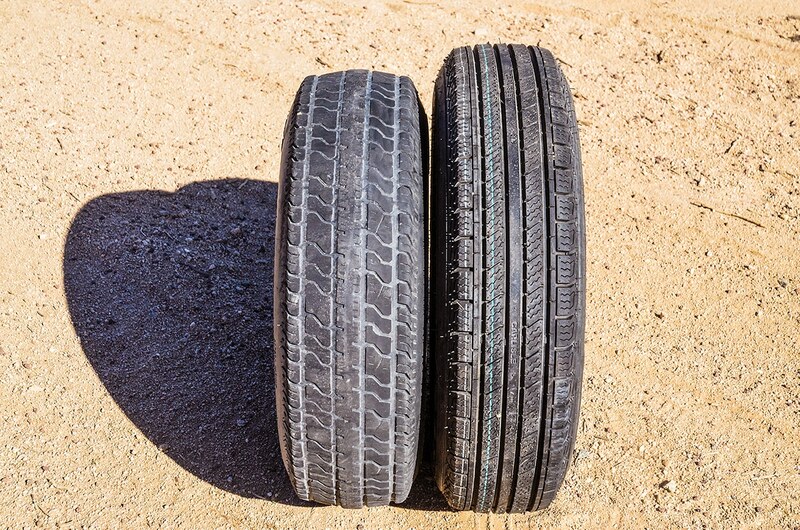 The old spare on the left shows signs of under-inflation. Here’s our spare for the Aluma 7816; the Carlisle ST205R75-15 Radial Trail has a C speed/load rating and is good to 81 mph. It wants 50 psi, so check pressures and fill before each trip. 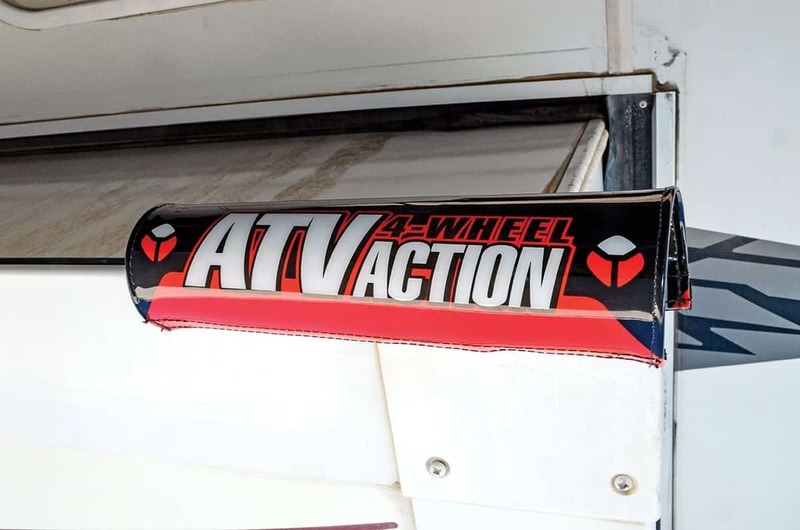 If your toy hauler has pop-outs, use ATV or dirt bike cross-bar pads to protect your head when working around the pop-outs, like when hooking up utilities at an RV park or filling the generator. It’ll cut down on the use of your first-aid kit. 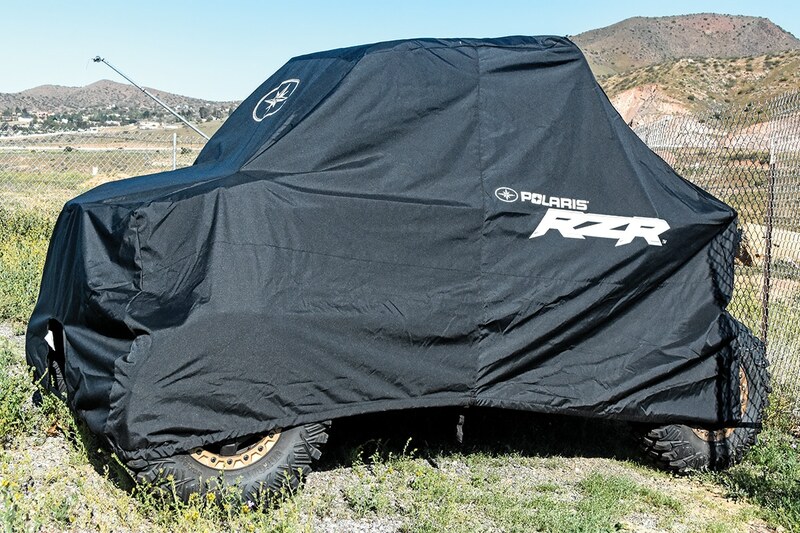 Polaris has a nice trailerable cover for the RZR XP1K, Turbo (#2879373) or RZR XP 4 (#2879949) that has a tight fit and a 1-inch ratcheting strap. The two-seat cover is $299.99, while the XP 4 cover is $399.99. Ratchet Jackets keep your ratchet tie-downs from scratching or rubbing your UTV’s powdercoating, bodywork and graphics. They’re neoprene sleeves that come in four colors. Visit www.ratchetjacket.com. Our Aluma 7816 wouldn’t safely carry two two-seat UTVs, so we added this aluminum section and a spare-tire mount. 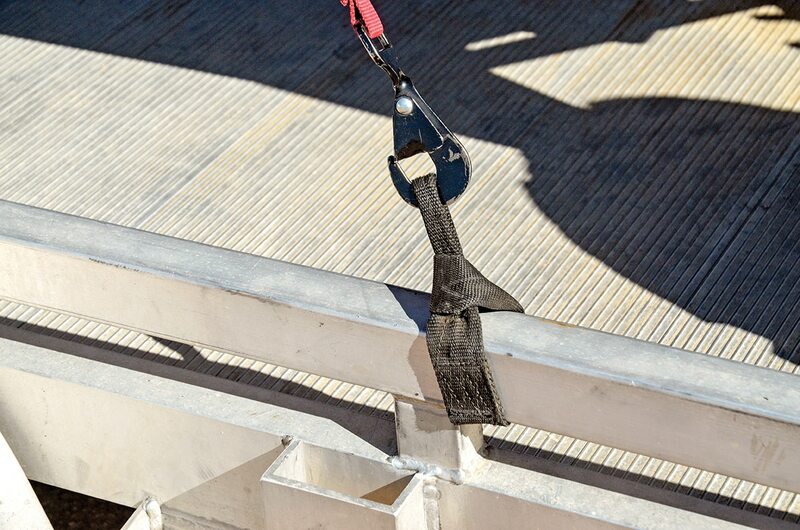 SpeedStrap has cool 12×1.5-inch extensions that let you strap where there are no tie-down points on the trailer. They’re $9.99 each. 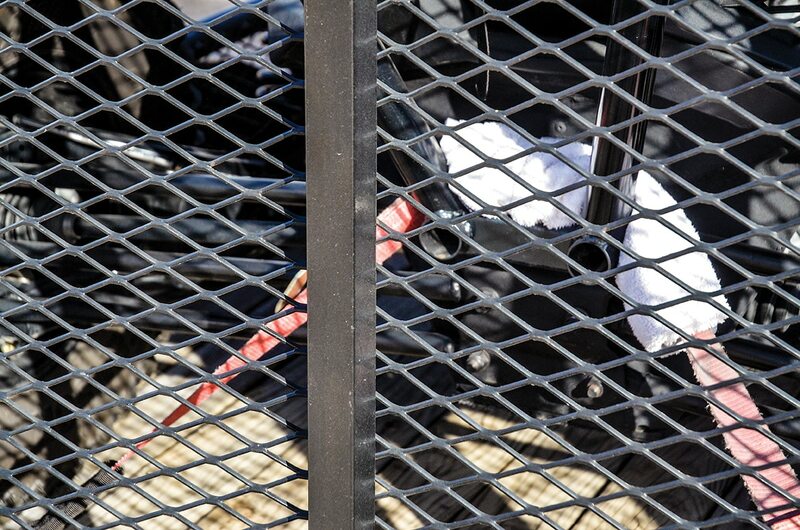 SpeedStrap has a cool two-strap system for the RZR XP 1000 or Turbo that includes this handy D-ring for the front. The RZR XP1K tie-down kit is $109.95; PRP Seats now owns SpeedStrap. The new RZR RS1 comes with a similar D-ring, but the Polaris website doesn’t list a part number yet. 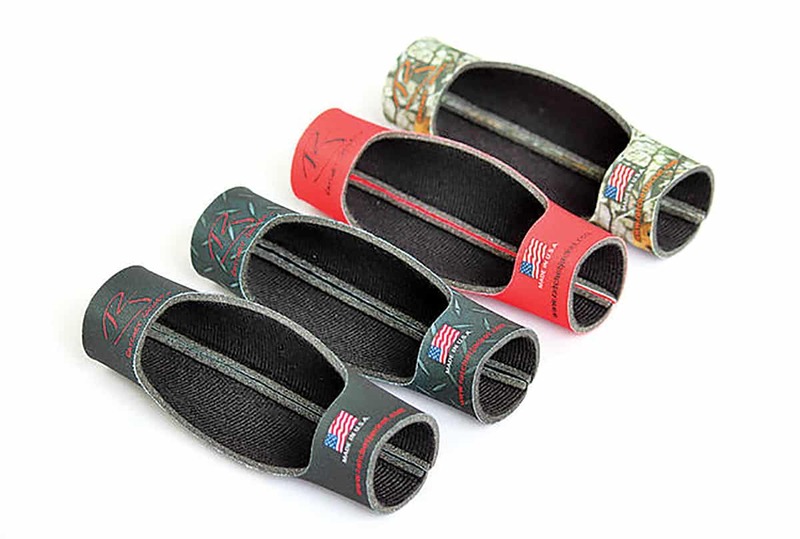 SpeedStraps have great ergonomic handles, but the 2-inch straps can cut into themselves if you wrap the loose ends together. 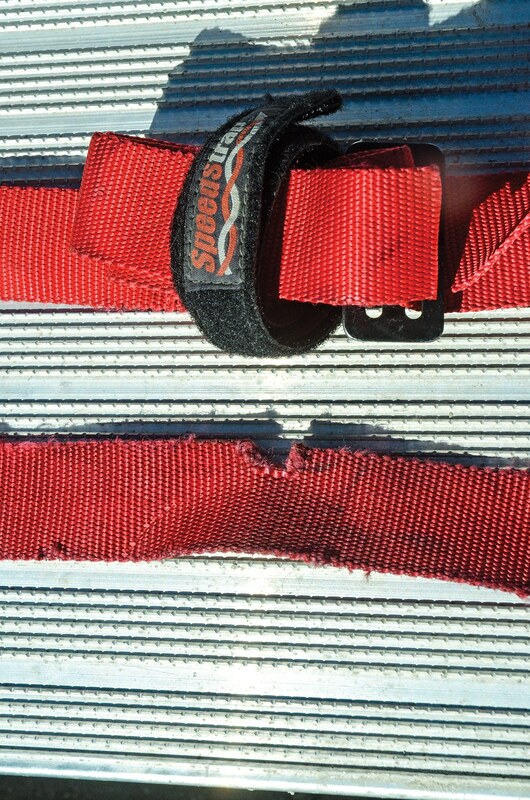 To avoid this, use the Velcro Speedcuffs to bundle loose strap ends. Rock crawlers don’t need ramps. 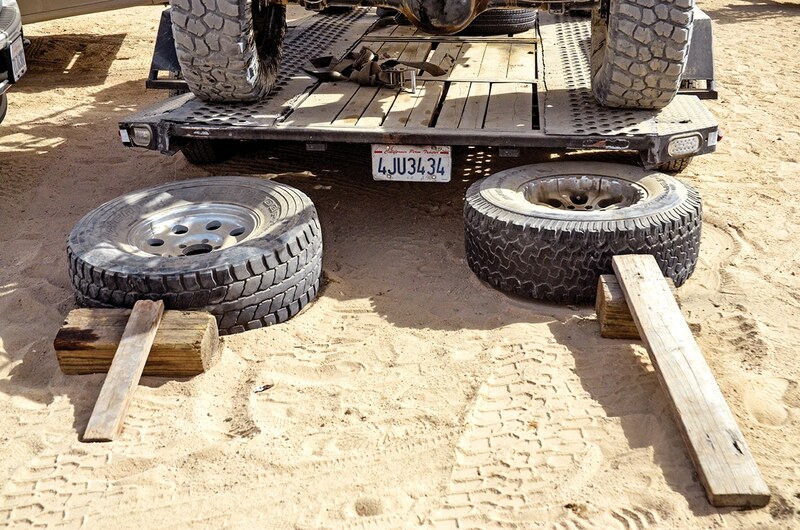 Spare tires and firewood do the trick and save the space ramps would take up. There may be a time when you’ll have to tow a buddy back to the truck or camp. It pays to be ready with the proper tool for the job. 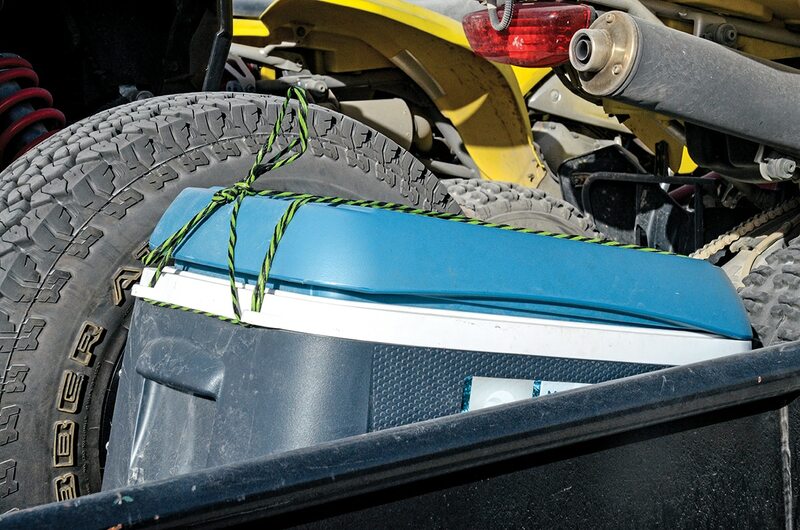 If your cooler has to ride in the trailer or bed of the hauler, be sure to tie the lid down. If we had a dollar for every cooler lid we saw on the side of the road, we’d be driving a Class C diesel-pusher motorhome! 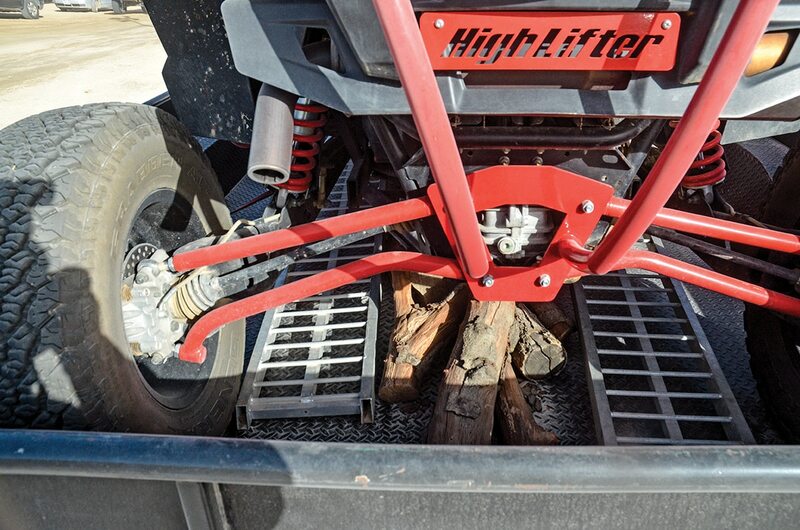 Firewood, ramps and whips can ride under the UTVs, as long as there is a tailgate to keep them secure. Also, gas cans can ride on UTV seats or the floor, but be sure to fill them on the ground. If your tow vehicle doesn’t have a back-up camera, measure your tailgate and place a sticker exactly in the center near the top. 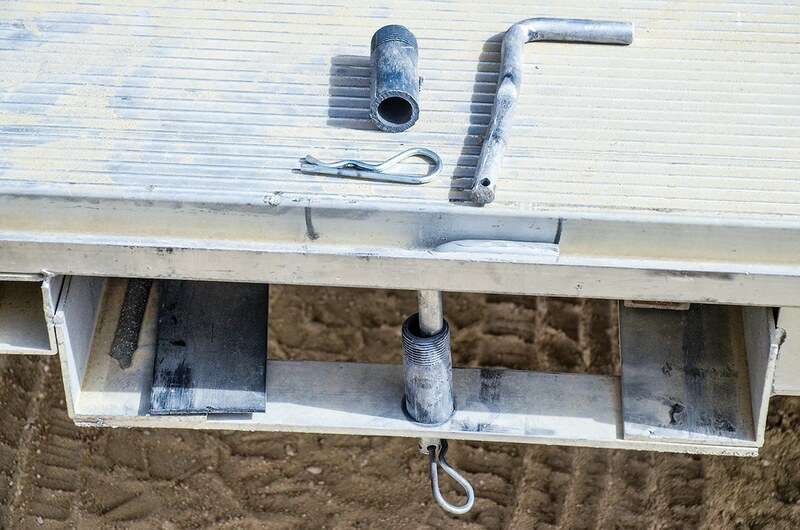 An arrow or section of whip with a suction cup placed on the trailer tongue lets you line up the ball for hooking up the trailer by yourself. Lumpy lost his hitch-pin lock key, and it only took one blow with a hammer to break the hitch-pin lock. 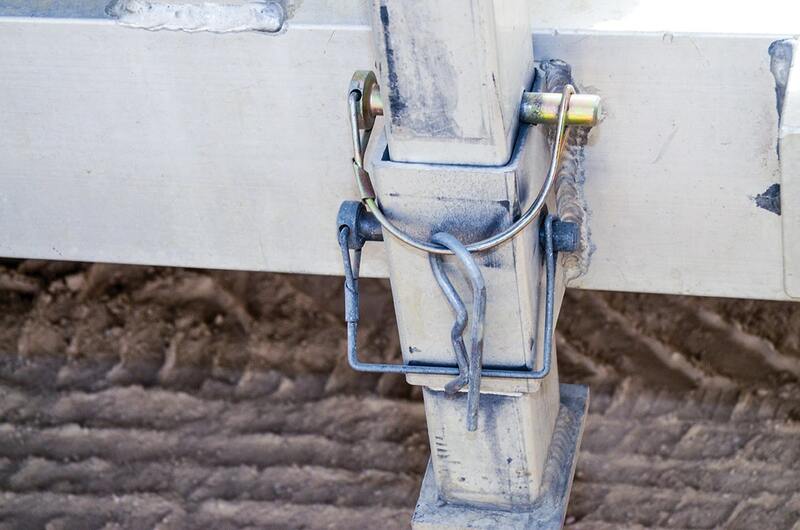 Locking the safety chain to the truck with a stronger lock is more secure.